Andrew Goodwin, who teaches architecture in the College of Architecture and Environmental Design (CAED) and owns the San Luis Obispo-based design consultancy firm Andrew Goodwin Designs, was named a 2017 recipient of the Norma Sklarek Award. Goodwin will be honored Feb. 5 at Cal Poly by Paul Welch, former executive vice president of the American Institute of Architects, California Council. The event, which is open to the public, will be held at 6 p.m. in the KTGY Gallery in Engineering West (No. 21), Room 105. Goodwin started participating about 10 years ago in architectural competitions for housing the homeless in the skid row area of Los Angeles through the use of innovative building systems such as shipping containers. 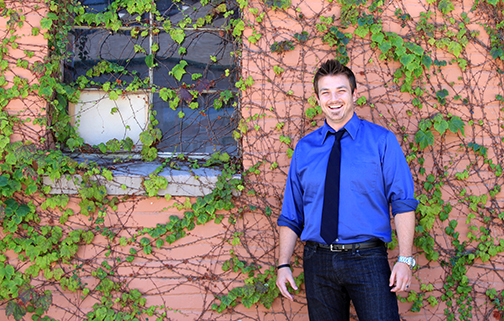 Goodwin earned his bachelor’s degree in architecture from Cal Poly in 2008 ahnd has taught at the university since 2014. Previously, he co-founded and served as principal architect for ConsciousBuild Inc., a design, build and development firm with its roots in sustainability and design activism. He later created RED Studio Foundation, which provided socially responsible design services for nonprofits. In 2013, it became part of the nonprofit design organization Journeyman International (JI). For more on Goodwin, visit http://www.andrewgoodwin.us/. To learn more about Cal Poly’s Architecture Department, go to https://architecture.calpoly.edu. Photo courtesy of Andrew Goodwin.